Books are lovely lovely things. And because Mama reads a lot, Miffy has decided that she needs them in her life, too. Thankfully, she has graduated from eating books to actually flipping through them. Kuting Magiting’s adventures. It’s obvious they’re well-loved. Among her current favorites is Robert Magnuson’s Kuting Magiting board book series. Kuting Magiting chronicles the life of an active and brave little kitten, Kuting Magiting, and his guardian, Good Morning Dog. Like most toddlers, Kuting Magiting is a bundle of energy and laughs. The situations he gets into aren’t any different from what Miffy puts me through on a daily basis. Relate much? Miffy reads her favorite spread from Go to Sleep, Kuting! Moar of Kuting Magiting, please! 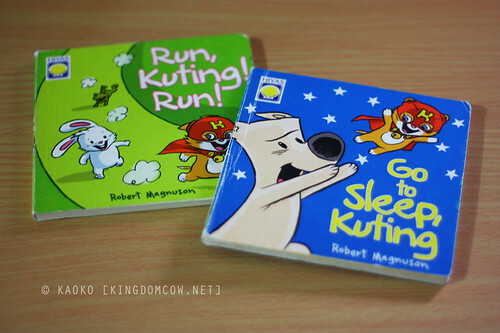 Kuting Magiting is a really nice series to get your little readers started with their love affair with books. My only complaint is that there are only two board books right now! Moar of that adorable little kitten, please! We love Kuting Magiting and await more adventures. 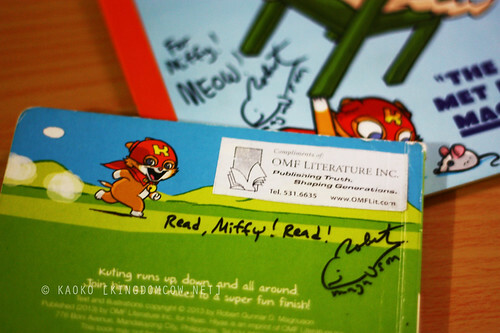 Miffy’s first signed book! Thank you, Tita Ida! This entry was posted in Books & the Written Word. Bookmark the permalink. Search and you shall find… potato chips! May I suggest something to read? Share book reviews and ratings with Kaoko, and even join a book club on Goodreads. Chrissie has read 1 book toward her goal of 36 books. Frances Aguinaldo: Who are the characters and there role in this story? Copyright Chrissie M. Peria © 2010-2012. All rights reserved.